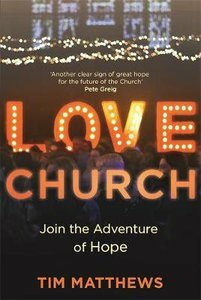 This book tells the story of the process of moving to Bournemouth to set up a new church from scratch, on the back of numerous similar failed attempts in London, and the bumpy and scary journey to success St Swithun's has travelled since. Tim demonstrates, through his story, how he has pushed through failure and disappointment with tenacity to trust in God and his plan and timing - and how hundreds of people are discovering faith in Jesus Christ as a result. About "Love Church: Restarting Communities of Hope"